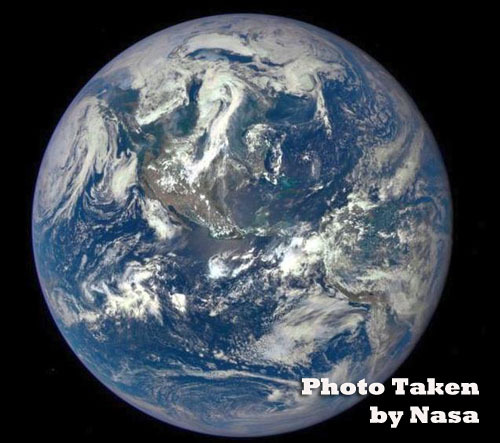 The curiosity of how the earth would look from space has always intrigued people. That is why the first task of countless space missions from across the globe is to send back the pictures of this planet that we call our home, from outer space. Though these images have given us a fair idea of how beautiful the Earth looks from space, none of them is comparable with the latest pictures released by NASA that have been captured from around 1.6 million kilometers away. The images have been clicked by the Deep Space Climate Observatory (DSCOVR) Spacecraft, after it reached its final science orbit. The spacecraft captured around 10 different images of Earth in various wavelengths ranging from near infrared to ultraviolet light. However, the image revealed by NASA shows a stunning view of Earth’s entire sun-lit side. The image provides a clear view of the various geological features of the planet, including the desert sand structures, river systems and complex cloud patterns. The DSCOVR spacecraft was launched as a result of the joint effort by NASA, National Oceanic and Atmospheric Administration (NOAA) along with U.S. Air Force in February this year. Even though the primary objective of the spacecraft has been to monitor the solar winds, it is well equipped with quality state-of- the-art Earth observation equipment, which includes NASA’s Earth Polychromatic Imaging Camera (EPIC). The mages sent back by EPIC will be used by the scientists to uncover huge wealth of information that can be used for environmental protection. It is being said that the images can prove helpful in measuring the levels of ozone in the Earth’s atmosphere as well as the growth of plants on ground. They can also help in building maps that will demonstrate how the dust as well as volcanic ash is distributed surrounding the globe as well as display information about other similar aspects. The high quality images clicked by EPIC, once again made us aware of the mesmerizing beauty of our planet, from even so far away in space, and also reminds us of the need to preserve it in its current form.